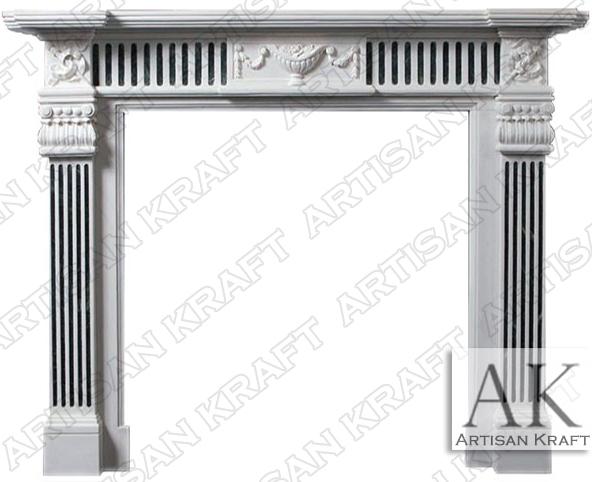 Our Georgia fireplace surround borrows from the rich architectural history of the state. It is pictured here in marble and is hand made from two different colors. A white and green were used to make this mantel by hand. This adds a nice contrast and allows the carvings to stand out more. The shelf and the hearth of the Georgia are typically the same color. Georgia Fireplace is part of our Antique Fireplace Collection. See this fireplace and others in our showroom or store. Most of our customers are out of state and purchase directly by phone or email. Stone: Marble, travertine, limestone, sandstone.